Had one last night worst curry ive had in my life... cheap for a reason dont do it!!! U can get diced chicken 2 quid jar of curry a quid and some microwave rice fir 60p and youll have a much better curry!!! Only Waitrose do it worse. Just make your own. Lamb meat is to expensive for these cheap products. Just picked one up myself for tonight  I think these are alright to be honest, I never microwave them though, I put them in the oven. I want weehamish to run for PM. Great deal unless your wife is a vegetarian. Had one last night worst curry ive had in my life... cheap for a reason …Had one last night worst curry ive had in my life... cheap for a reason dont do it!!! U can get diced chicken 2 quid jar of curry a quid and some microwave rice fir 60p and youll have a much better curry!!! Or it could mean there are 2 for you! Is this one of those Tesco chicken ready meals where the chicken still comes from Thailand? I bought several tinned "meals" which in small print was labelled as containing chicken from Thailand, but not being too picky & wanting not to waste it, gave the curry a try. Not a word of a lie, my gut was bad for a week. Never had that with any curry before. Googled about Tesco Thai chicken use & Tesco PR spin replies to customers complaints was that its chicken from Thailand was checked regularly for high standards... blah, blah, blah, but after that meal, I'll be avoiding any meals that do. I'm not normally a scaremonger, but if it does, I'd recommend to avoid. 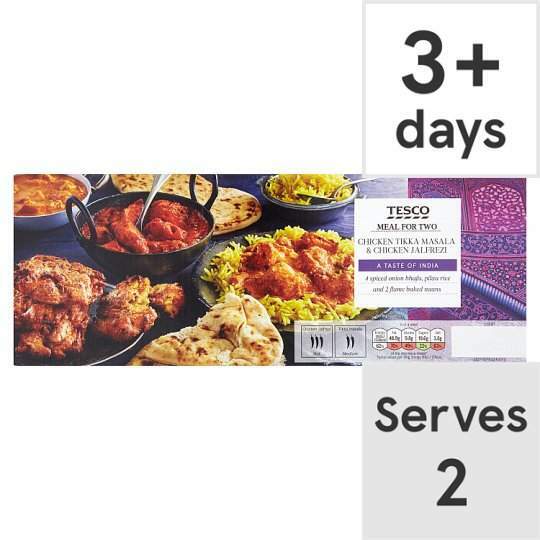 Is this one of those Tesco chicken ready meals where the chicken still …Is this one of those Tesco chicken ready meals where the chicken still comes from Thailand? I bought several tinned "meals" which in small print was labelled as containing chicken from Thailand, but not being too picky & wanting not to waste it, gave the curry a try. Not a word of a lie, my gut was bad for a week. Never had that with any curry before. Googled about Tesco Thai chicken use & Tesco PR spin replies to customers complaints was that its chicken from Thailand was checked regularly for high standards... blah, blah, blah, but after that meal, I'll be avoiding any meals that do. I'm not normally a scaremonger, but if it does, I'd recommend to avoid. "In the past Tesco has sold a chicken roast dinner labelled as "produced in the UK" when the meat has come from Thailand. It will now relabel an estimated 1,000 lines of meat, spelling out the country of origin.21 Sep 2009"
These are very poor quality. I'd want to be paid more than eight quid to eat one. I think the 2 individual Currys + 2 sides deal for £5 taste better (certainly sides are better quality). More choice too. they taste like crap... who even eats them???? "Plastic curry" as me any the wife call it. Not much like authentic curry but not too bad in its own right. Bought this yeaterday just to try. Never again. Utterly di Only edible thing was the bread. Binned. None of the supermarket curries are any good only Waitrose comes near to being edible. Had this yesterday, good value for money. Been buying these for years at the normal 'deal' price of £5. Missing the point man, if you're so into making your own curries then you won't have tasted these. 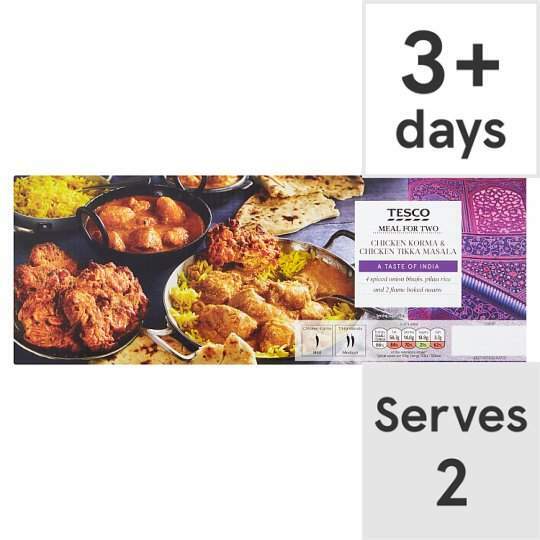 I don't doubt that a lot of the curries on your little website will be better, but the Tesco ones are nice, quick and cheap. If you're not a jobless and getting home from work at 6/6:30 you don't have time to make a curry entirely from scratch. NEXT. Whoever made these fake recipes let me tell you, coconut and creams are not used in any real curries. Rest of the recipe was ruined by pastes. 2 currys, 2 rice, 4 onion bhajis and 2 naan. Look at the reds on the traffic lights! Heart attack in a box. These aint bad for what they are and for £4 are stupidly cheap.